What system requirement I need, in order to browse rthk.hk in best quality? rthk.hk is best viewed by the most popular browsers, such as Chrome, Firefox, Internet Explorer, Safari and Edge, with their up-to-date version. 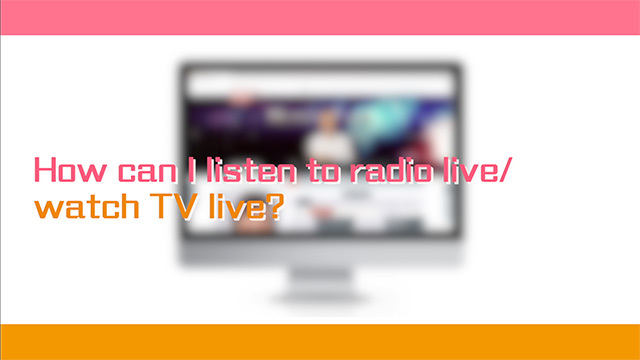 How can I listen to radio live / watch TV live? On rthk.hk homepage, find “直播LIVE”. Select a radio or TV channel. Click the play icon and start the live webcasting. When I am listening to live broadcast, why the player will sometimes get buffered or unsmooth or even go offline? user’s computer is running a programme or webpage that requires bandwidth to a large degree. For example, simultaneously download files or videos from online websites, etc. According to actual needs, you may turn off individual program / web page and try again later. You can even enquire about the network issues from your Internet Service Provider (ISP). How to listen live broadcast by using internet radio devices? 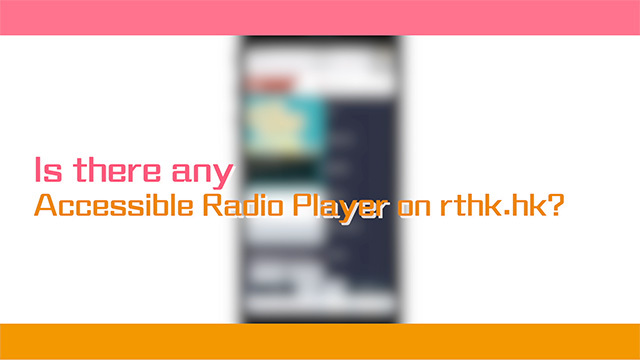 * RTHK does not have co-operation with any internet radio manufacturers. Please check with your internet radio brands if there are further inquiries. How can I listen to radio archive / watch TV archive? At the top of rthk.hk , find “ARCHIVE” . How long will the rthk.hk Radio and TV programmes be kept on the web? rthk.hk provides programme archive for the last 12 months, except for those with copyright restriction. Why sometimes the beginning or ending part of a radio programme archive file is incomplete? 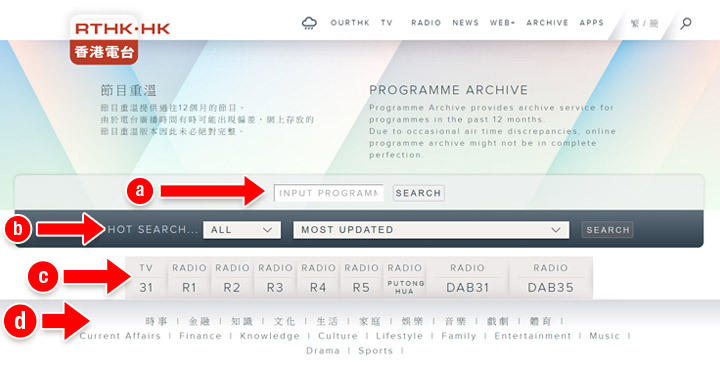 All radio programme archive files on rthk.hk are uploaded online automatically after the live webcast according to the radio programme schedule. However, due to occasional air-time discrepancies in the programme or news, online archive files might not be always in complete perfection. We apologize for any inconvenience caused. How can I listen to archive with "Windows Media Version" or "Real Player Version"? Windows Media Version - Get Microsoft Windows Media Player application. Real Player Version - Download RealNetworks Real Player (Free Version) application. Any offer of accessible player for visually impaired person? Visually impaired person can access Radio Programme Archive (Accessible Version) page to enjoy radio archives. They can input the channel, broadcast date, time and find the programme easily. Moreover, shortcut keys are allowed to operate the player’s functions easily. How to fix the problem of "Error Loading Player: No Playable Source Found" being displayed when attempting to play live / archive programmes? Adobe Flash Player should be installed to enjoy multimedia content on rthk.hk. 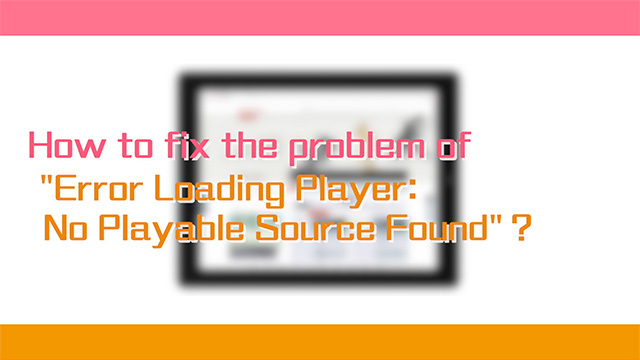 This error message appears when Adobe Flash Player cannot be loaded. 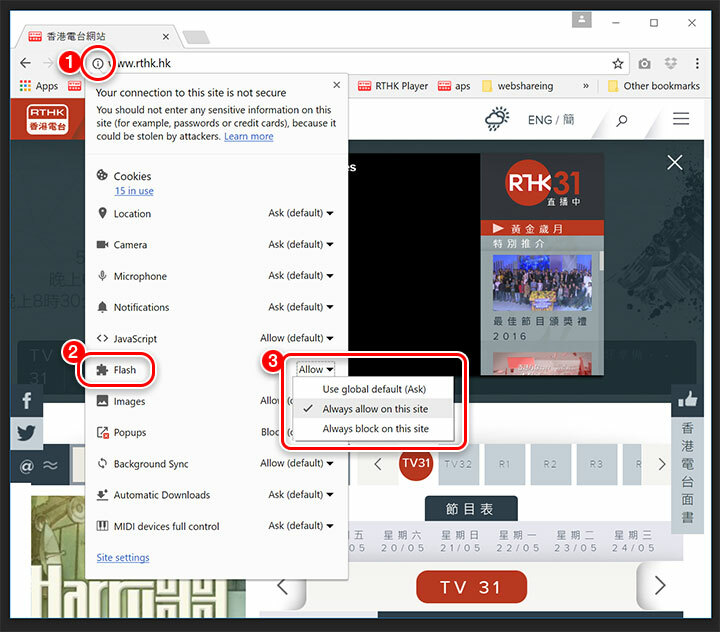 For Firefox users, please go to rthk.hk, then press the “brick” / plug-in icon next to the address bar to allow Adobe Flash Player to load on the page. If problem still occurs, you may go to the function menu of the browser, choose “Add-ons” and select “Plugins” to see if “Shockwave Flash” requires an update. 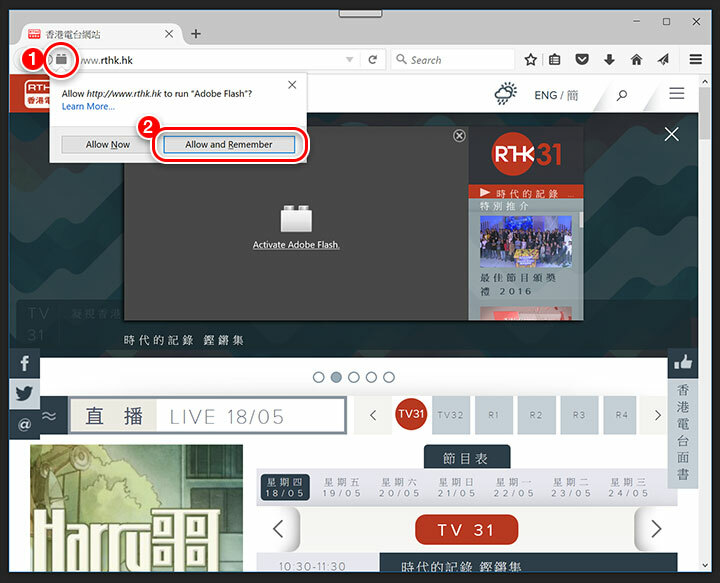 For Chrome users, if you have blocked Adobe Flash to load before, you can go to rthk.hk, then press the “i” / view site information icon at the left of the address bar. In the pop-up, find the “puzzle” / Flash icon and press the drop-down list next to it, select “Always allow on this site”. If problem still occurs, at the address bar, please input “chrome://components” and press Enter. Then, under "Adobe Flash Player," click “Check for update”. If Adobe Flash Player is not installed on your browser, please access this page to download and install. Can I download programmes from rthk.hk? As some contents involved copyright, only those contents on "Podcasts" and "RTHK Creative Archive" of rthk.hk are allowed for download. You may refer to "Copyright" for details. We have certain rthk.hk programmes exclusively selected for the public to subscribe, download and enjoy cross platform playback. All RTHK podcasts will be consolidated in the "Podcasts", where you could search, subscribe, download and even playback on demand. Please visit the "Podcasts" to check out the details. Does rthk.hk have any apps? 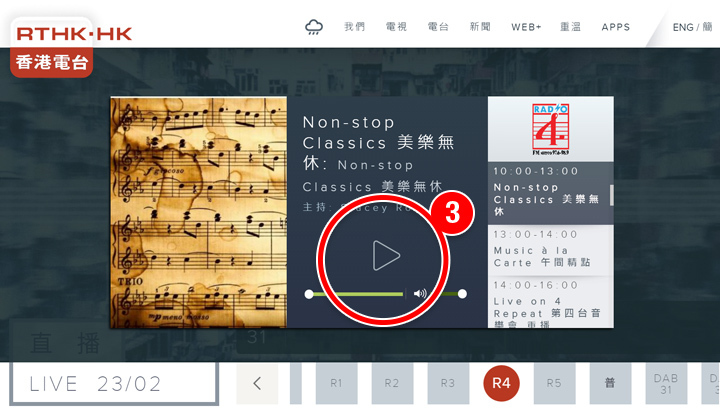 RTHK has launched several apps of different functions. For more information please visit "RTHK Apps".